Seeing the closing chapter of The Hunger Games has made me realise what a quick franchise this has been. Lionsgate didn’t muck around with getting these books to screen, and it makes a certain amount of sense – it meant the actors’ ages weren’t a problem, and they didn’t have to worry about audience interest waning. With Disney planning a Star Wars film a year, it seems the good old days of having to wait years between cinematic instalments are well and truly over. Mockingjay Part 2 is a lot like Part 1. By that, I mean that it follows the novel very closely, and all of its flaws are the same flaws that were present in the book. It’s not that I never liked ‘Mockingjay’ – even now, I’m impressed by the decisions author Suzanne Collins’ made to end the series. It’s just that, let’s face it, ‘Mockingjay’ is a bit of a downer. Not only that, it doesn’t have the same narrative drive that was present in the first two books. It doesn’t move along at breakneck speed, but rather lumbers towards the ever so depressing conclusion. Much like the film. I’m sure a different director could have given this two-partner a bit more dramatic oomph. There’s no denying that Katniss’ attempts to take the fight directly to the Capitol aren’t as powerful as they should be. Then there’s the fact that, much like the previous films, the gore has to be hidden, so blink and you’ll miss some very shocking moments. I also couldn’t get over the fact that so much of this film was shot in near darkness. Whether they were hiding the fact they skimped on the budget, or covering up shoddy VFX, there are three or four scenes where I had no idea what was going on. Jennifer Lawrence is strong here, and she finally gets do stuff. 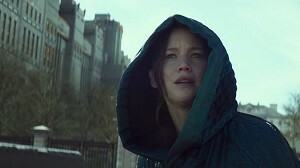 One of the criticisms of the second and third films was that everyone so busy saving Katniss, it took away from what made her so cool in the original Hunger Games. This isn’t her worst work – take a look at the recent X-Men films to see how you waste a great actress – but there are only two or three really great scenes for her to work with here. Jena Malone is still brilliantly unhinged as Johanna Mason, so much so that I wish they’d inserted her character into more of the film. Michelle Forbes is a welcome newcomer – it’s great to see Ensign Ro in Panem – whilst Gwendoline Christie’s single scene is appreciated. It felt like both Gale (Liam Hemsworth) and Prim (Willow Shields) weren’t present for enough of this film, considering how significant they are to the narrative, but this issue would presumably be resolved if you rewatched Mockingjay Part 1 and 2 back to back. At the end of the day, Mockingjay hits all the right moments, but I felt just as deflated with this as I did with the book. Collins’ series is a depressing look at the futility of violence, and as such, this was never going to be a ‘fun’ night out at the cinema. Then again, when the best you can say about a film is that it’s faithful to the source material, perhaps you know something’s wrong. This entry was posted in Film Reviews and tagged Action/Adventure, Science Fiction, Tragedy by Stuart Wilson. Bookmark the permalink.